SimCLIM uses the latest CMIP5 climate data. Maps, graphs and charts of various aspects of climate change can be generated spatially and for sites, for cities, provinces/states, nations, and the world. The flexibility of SimCLIM is limitless. Now the power to model past and future climate can be in your hands! What can you do with SimCLIM? Ensembles: Ensembles are now easy to create as you use on the fly; you no longer need to create and manage "ensemble templates". Supports the new CLIMsystems License Manager, allowing for network license management for organizations. SimCLIM is designed to support decision making and climate proofing in a wide range of situations where climate and climate change pose risk and uncertainty. 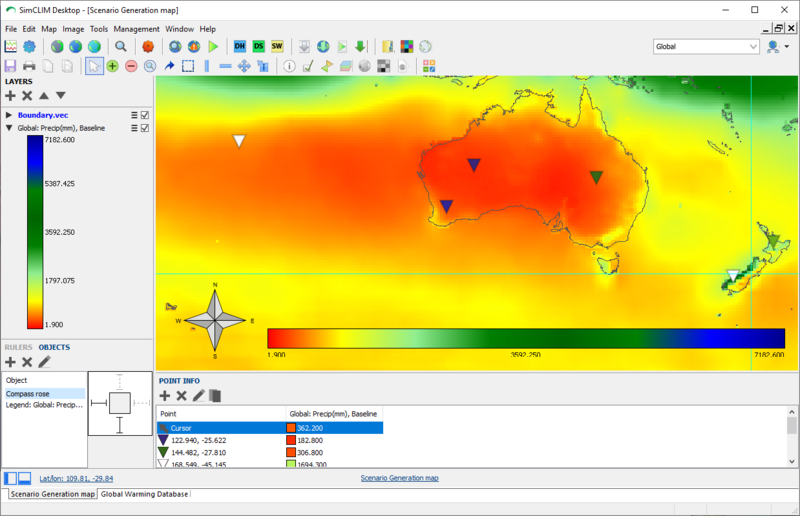 A user customised SimCLIM Open Framework System software package has the capacity to assess baseline climates and current variability and extremes. Risks can be assessed both currently and in the future. Adaptation measures can be tested for present day conditions and under future scenarios of climate change and variability. With the program, users can conduct sensitivity analysis and examine sectoral impacts of climate change. SimCLIM supports integrated impact analysis at various scales. A series of training videos are available on the SimCLIM website, including discussions on how to create ensembles of general circulation models, generate site-specific scenarios, and browse data. CLIMsystems strives to empower individuals, organizations and communities to reduce the risks posed by climatic variability and change, through the provision of software tools and scientific information for better decision-making. It is dedicated to ensuring that its customers receive the highest quality products and support required to successfully use and benefit from its software and services.